I remember when I finally took my call to marriage seriously. I had been dating for a few years and was sitting in a restaurant with a girlfriend. She was telling me how she was content to never get married if she couldn't find someone who measured up to her expectations. "I won't settle for less," she said. "It's not worth it to me." She, like me, was devout. I noticed, however, that her rigidity made it difficult for her to understand the complexities and imperfections of real relationships. She was impatient with people's human weaknesses. On the positive side, she could be serene and prayerful at her best, almost angelic in her purity. While I would normally have seconded her reticence to settle for a mortal man, I suddenly said, "No! I know God wants me to marry and have kids. I can feel this in my bones. I know that I have to do what he's calling me to do. How could I ignore a call to a vocation. Wouldn't that be wrong? Holding out for perfection won't work, because nobody is perfect." She looked surprised, but as I explained my commitment to following God's call, her facial expression softened into sympathy. How could she blame me for wanting to fulfill my purpose? A flower bulb is meant to blossom in the spring, and likewise each of us has her own purpose in life. While it may seem as if I was hit with a lightning bolt or instantly enlightened, this is far from true. I had debated these issues internally and pondered my vocation many times. I also struggled with perfectionism. A spiritual director once urged me to remember that no man is perfect and that living with an imperfect man can be a road to holiness in itself. Stop for a minute and think about how many self-help books you have seen me review. I myself am trying to think of even one I've read ... ever. I must have. But darned if I can think of one. 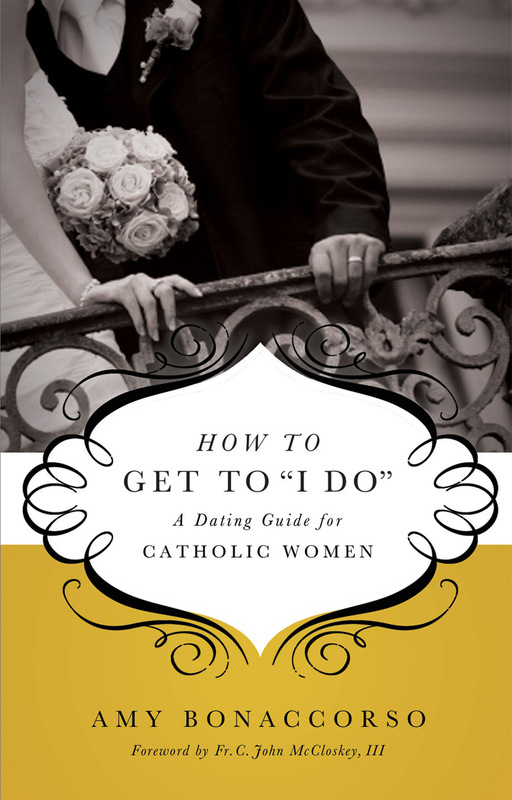 Therefore, when I present to you this "dating guide for Catholic women" you know it must be unusual. Unusually good. Please believe me when I say that I wish I had enough cash to buy a copy for every single Catholic woman I know and give it to them. Coming to marriage, as I did, as an agnostic, late-twenties young woman, stumbling my way through meeting and dating guys, it seems like a no-brainer. You meet a guy who finally clicks in the right ways. He loves you too. Miracle! And it keeps going so you get married and settle down to finding out what life together is really all about. That is difficult enough for both men and women in general these days. However, now that I have two daughters who are young women, know many of their friends, and have many younger, unmarried female friends of my own, I can see that there is a way to make it more difficult. Add being a devout Catholic into the mix. For some reason that adds a whole set of complications that never occurred to me before. Some women insist on marrying only a Catholic. Others feel they are failed by their church if the parish singles group isn't providing suitably eligible men. Most struggle with chastity on some level or other. That doesn't even count the potential minefield of on-line dating, meeting men from different countries (not to mention different faiths), hostile parents, and all the other hazards of modern dating. Imagine my pleasure and relief when I read How to Get to "I Do" which handles every question and issue with calm, practical commonsense. She dated for ten years before marrying and encountered many of the everyday problems that modern, devout Catholic women run into when trying to find that good man who they will "click" with. This is really a complete guide, covering not only where to meet men but a variety of topics, such as as meeting in a public place for a first date, Catholic places outside parishes to meet people, dating within your means, handling guys who flirt with everyone, and much more. I was equally pleased to see that she goes past finding and discerning guys to date and delves into issues to consider before committing to marriage, coping with disappointment and betrayal, how to handle remaining single for a long time when you are dying to get married, engagement tips, and planning a wedding. Obviously this is aimed at Catholics but it seems to me that most Christian women would profit from it as well. I would even recommend it to nonbelievers who share common values with Catholics, such as valuing themselves enough to remain chaste until marriage. (There are such women, although modern news and entertainment would lead you to believe otherwise.) There is plenty of good, solid advice here to be gleaned for many situations that are common to all dating women. This is a book that I will be recommending to many women, starting close to home. My own daughters can benefit greatly from it. P.S. I know there are wonderful guys out there who are suffering from similar problems. many of the issues discussed in this book work for both sexes, though some are female-specific. So now, where is their book? I suspect there isn't and won't be one for the men, since there are only a couple of dozen of us. This proves that you really need to research your prey more carefully before you go hunting. Does a guy come with it? :) The only guys that meet my religious criteria always enter the seminary!!! !